Exotic and hypnotic colors. The mysterious sound of the howler monkey. tickling aromatic scents. Let the subtle of the jungle surround you, the sweet scent of tropical forest fille your soul. Delicate orchids, palms trees swaying heavy coconuts and exquisite variety of birds singing in the morning. In the evenings a soft breeze and sunshine, vibrant moon ... rain will make you feel like at paradise..
We are located in Barra del Parismina, close to the Tortuguero National Park in the Caribbean north of Costa Rica. Strategically located between the jungle, in harmony with nature and easy access to the national park, surrounded on one side with the Parismina inlet and across the Caribbean Sea; preferred place for spawning of the green turtle (Chelonia myda) that arrives in the months from July to October. Surrounded by plants native to the area, faces the river, we offer simple and comfortable 6 rooms where at the early morning howler monkeys (mono congo) end your deep sleep. 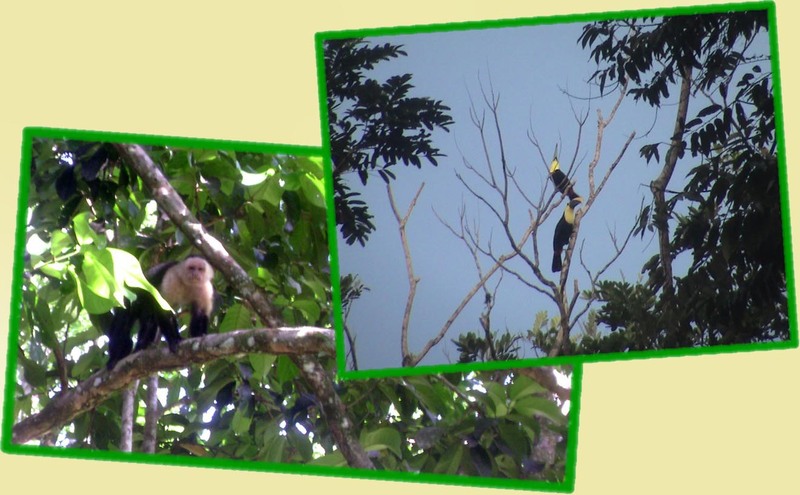 Also the various tropical birds that sweetened their ears with their songs. You will see insects, butterflies, reptiles such as basilisks, iguanas etc. Within the property, you can walk the trails where you can watch for various types of trees planted and different species of insects, spiders and birds typical of the area, all in their natural habitat. Copyright 2015 Esmeralda Lodge. All rights reserved.